One of the annoyances about chatting with someone in Facebook Messenger on your computer is the fact that they other person knows when you’ve seen their most recent message. So you kind of feel obligated to go ahead and reply sooner, since you know the other person knows you’ve read that last message. Too much pressure to keep the conversation going! Here’s how you stop that. Since I’m at my computer much of the time, this happens to me fairly regularly. If a friend or a client sends me a message on Facebook, it’s often about a computer repair or to inquire about buying one of my refurbished laptops. I’ll see the message show up, and I know that if I don’t answer it then, I’ll probably forget about it until I happen to notice it a few days later and that’s not good. So I respond. Then the person sends a follow-up message or question. And now I’m in an ongoing chat, even though I might have lots of work to do and really don’t have the time available to chat. But when the other person sends a message and it shows up on my screen, that person gets the immediate notification that the message has been seen by me. Since he knows I’ve read the message, it looks rude if I don’t reply. But now there’s a way around that social awkwardness! It’s an extension for Google Chrome called Unseen. And what it does is pretty much exactly what you would expect it to do. 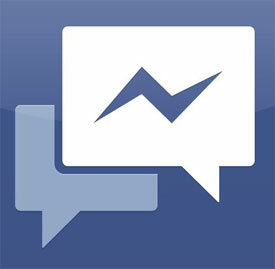 It removes the “Message Seen” notification from the Facebook chat. And it does a few other things too. You can play around with those various functions to see what they do, but really the first one is the one we’re talking about – you can read the most recent message, and the sender won’t get any notification that you’ve read it. I also like the “block the typing indicator” option too. 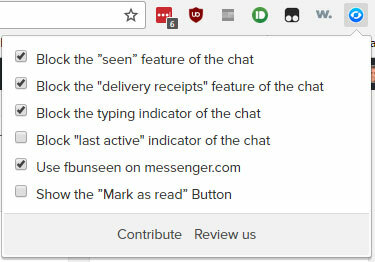 My chat buddies don’t need to know when I’m in the process of typing a message! Let them wonder! I think there’s an extension like this for Firefox also, but I haven’t investigated that since I use Chrome almost all the time. BUT – since most people now use Facebook Messenger on their phone – you might be excited to know that there’s also an Android app that does the same thing this Chrome extension does. Just go to the Google Play Store and search for Unseen – No Last Seen. It’s free but of course there will be ads. I assume there’s also an app for iOS but I don’t use an iPhone so can’t really tell you about that. I would believe that this is a potential problem for users of unseen. I agree, that’s a problem.